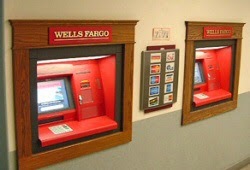 Actually, there are two machines, operated by Wells Fargo & Company. They are located in McMurdo Station, an American research center and Antarctica's largest community, capable of supporting up to 1,258 residents. Since maintanence is performed only once every two years, one machine serves mainly as a backup. The cash is simply restocked from takings at the limited places where it can be spent, such as the company store, and so is continuously recycled. By the way, there is no surcharge if you are not a Wells Fargo Bank customer. These were also the first ATM machines to become Y2K compliant (requiring a century indicator in the program and accounting for leap years). Technically, one could say that Wells Fargo manages the ATM banking for a whole continent.